IMAS’s award winning brands, publications and websites, include TV Technology, TV Technology Europe, TV Technology Latin America, TV Technology Asia Pacific, Radio World, Radio World Engineering Extra, Radio World International, Radio World Francophone, Radio World Latin America, Pro Audio Review, Audio Media and Broadcast & Production Italy, as well as the contracts for the official show dailies for NAB and NRB. IMAS’s headquarters is in Falls Church, VA, with offices in the U.K. and Italy. 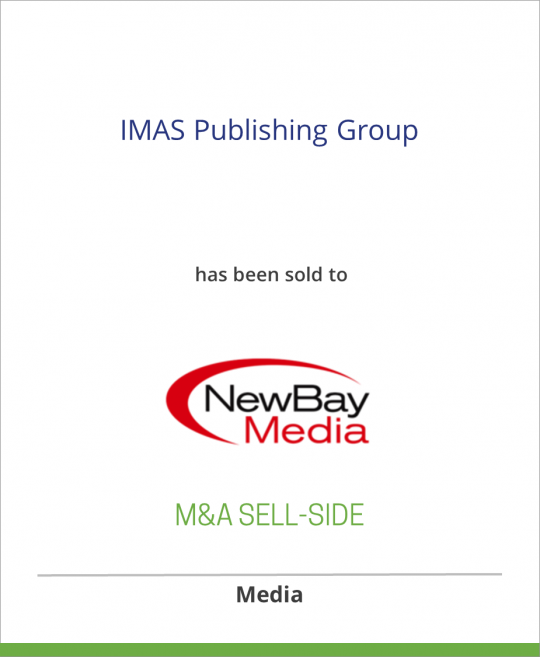 NewBay Media is an integrated media company serving the professional audio, systems integration, video/broadcast, musical instrument and K_12 education technology vertical markets in print, online and in person. NewBay provides communication solutions to readers and marketers through 14 award-winning publications, 40 websites, 6 events and 5 show dailies. NewBay reaches more than 3 million dedicated professional/enthusiast readers each month. NewBay’s properties include such well-established brands as Pro Sound News, Guitar Player, Bass Player, Systems Contractor News, Keyboard, EQ, Residential Systems, Rental & Staging Systems, Videography, DV, Government Video, Television Broadcast, Digital Cinematography, Technology & Learning, DV Expo and Government Video Technology Expo. Additional information on NewBay can be found by visiting www.nbmedia.com. NewBay is an affiliate of the Wicks Group of Companies, L.L.C. (www.wicksgroup.com), a New York-based private equity firm focused on selected segments of the communications, information and media industries.